Malcolm Dash is the Director of Operations at the Israel Institute for Strategic Studies, and has written for many Israeli publications such as Israel Rising, Algemeiner, and others. In a review of the new book “Banned: How Facebook Enables Military Islamic Jihad,” he delineates not just what the book reveals, but identifies with clarity some of the finer points of the book – and its attendant issues- that the casual reader might miss. 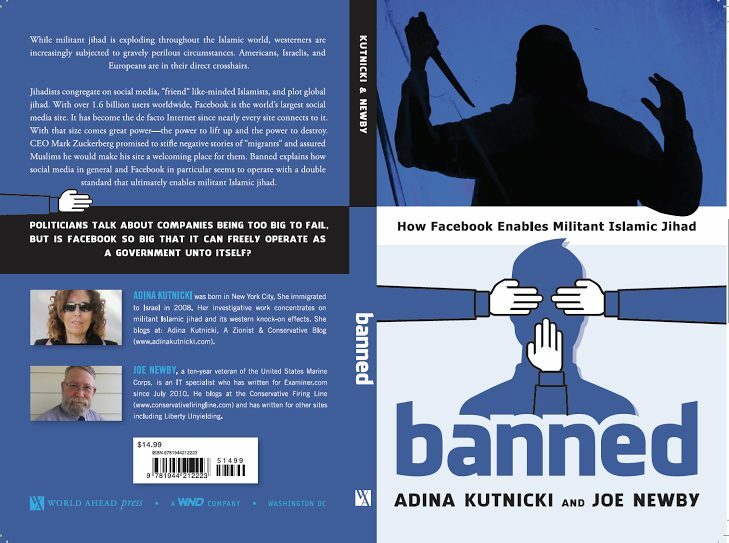 “BANNED: How Facebook Enables Militant Islamic Jihad” is an educational and lucid exploration into the world of Social media, Political Correctness and its intersection with Jihadist Islam. The authors have, with confidence, used a significant methodological approach to describe the books main argument: social media transforms and manipulates what was once traditional media discussions. They accent how social media shapes and controls opinion, narratives or anecdote into a ‘public’ debate by the use of a simple ‘share’ button. This is indeed transformative and annuls traditional media-society interactions. The authors, Israeli-American Adina Kutnicki, a widely-read investigative blogger, and Joe Newby, a veteran of the United States Marine Corps, today an IT expert and a conservative columnist, correctly assail the ubiquitous Facebook mass medium pages. This technology, they point out, is far from passive. It is based on algorithms that affect which events, issues, debates, topics and narratives are to be popularized. Even though ‘algorithms may in part be oriented by past behaviors and choices,’ they do reinforce, mainly through this path-dependent mechanism, specific race, class and gender behavioral codes. “Banned” identifies the Politically Correct zealotry that permeates the ether of social media, especially the discourse pertaining to the violence of Islamic culture. The authors “skewer” Facebook for its speech policing, trigger warnings, perceived micro-aggressions, hashtag activism, safe space rhetoric, to name but a few—all this in the name of enlightened liberalism. This book is a useful point of departure for future research into how liberally progressive platforms in the social media foster interactions that distort arguments, political commentary which inculcates political correctness, which in turn leads to polarization rather than reverting to traditional precedents and consensus. The book is available on Amazon at this link.